Roasted & salted. 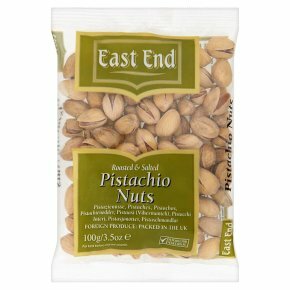 Suitable for vegetarians.East End Pistachios, Roasted and salted, are ideal as a snack. Pistachios are predominantly natives of the Middle East, America and Central Asia. They are grown on small tender trees, under warm arid conditions. The pistachio being a smooth, twin-shelled nut, housing a small, oval, green kernel. Pistachios can be eaten raw, by removing the kernel from its shell. They are much used as a colouring and flavouring for a wide range of foods, some savoury and many sweets, including nougat and ice cream. Kernels should be removed from their shell before eating.<br><br>Remember small children can choke on nuts.